Workrite 215-WIDE Height & Angle Footrest - Jestik, Inc. minutes! The Height & Angle Footrest is a flexible footrest with height and angle adjustability to accommodate a variety of leg lengths and allowing for use with a range of office seatings, including sit-stand workcenters. 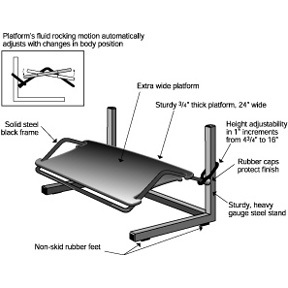 The rocking platform automatically adjusts with changes in body position, providing continuous support. It allows you to move your legs at varying angles to relieve tension on your ankles, legs, knees, and back as you work on your desk all day. Height and angle adjustable to accommodate a variety of users. Durable platform made from plastic composite.